What MVP Is All About? MVP stands for minimum viable product, the very basic version of the new product with the optimal set of features enough to test the hypothesis whether the core startup idea will find its demand among clients. Building such a product as a MVP startup is all about getting the initial feedback from users or, in this case, early adopters. First introduced by Eric Ries in 2008, the approach of developing a minimum, yet enough for validated learning, version of the product is now widely applied not only by startups, but by large corporations launching new product lines as well. The main benefit of this methodology lies in receiving the first feedback as early as possible and tuning the business concept according to it further. One of the most common examples in IT world is going for hybrid mobile development for the new app instead of coding native Android and iOS products. All these issues can be tackled through the implementation of a minimum viable product or MVP. Startup founders are likely to search for financial support among angel investors, banks or crowdfunding platforms like Kickstarter or Indiegogo, but to attract contributors they have to prove, that the idea of the venture is not completely abstract – it is feasible, and that the project has potential to succeed. MVP is a working solution, as it is a material embodiment of the startup idea, which gives the would-be investors understanding of what they are contributing to. Besides, launching a sort of demo helps the owner see users’ reaction to the product, its weak points and drawbacks. At the same time MVPs are usually low-cost and fast to execute. Startups connected with IT sphere, namely mobile application development, have a whole range of questions to answer, like “what platform to focus on? what framework or language to choose?” and many others. Years of experience in mobile app development have shown that the best solution for young startups is building a hybrid MVP. Native application development by MVP startup developer, unlike hybrid, means twice as many human, time and consequently financial resources spent for coding and maintaining two separate applications (for Android and iOS operating systems) by two separate teams of developers, which is definitely an unattainable luxury for young startups. Is the MVP Method Suitable for All Technological Startups? disruptive (offering products to the new markets with assumed needs). MVP will work great for testing disruptive innovation, but will fail in applying it to the product based on sustaining innovation. MVP startup engineer can launch MVP when startup doesn’t have defined audience yet, when it suggests solution to the new problem or new emerging needs. In this case the innovation lying behind the prototype would be enough reason for early adopters to purchase or sign up for the product. It is a multi platform development which means that one code can function on devices with different operation systems. A number of free tools and frameworks like Apache Cordova eases the development process and gives the application access to native capabilities of the device, which hybrid apps do not possess initially. Besides, in case of updates, users of hybrid applications don’t have to install them manually, since everything is done automatically for them, given that they have internet connection. Thus, multi platform app saves budget and time of the startups and provides fairly good user experience. Eventually, only after hybrid MVP is released and proves to be worthy, all the downsides are eliminated and investments for further project completion are made, entrepreneurs might precede to developing costly and time-consuming native mobile applications. Infographics with the information on hybrid development, such as technologies used in hybrid mobile development, popular hybrid apps, pros of hybrid apps and statistics on using mobile apps and IT solutions in UK business. What Challenges Are Facing Startups Starting out Their Product Development? New MVP startups are usually struggling with the problem of finding the best technologies for building a basic version of product enough for testing their hypothesis for a very limited budget. Despite of having great innovative ideas in mind and clearly seeing the target audience, not all startup companies have enough resources to properly plan, prototype, implement and test the product. Another problem is limiting the scope of possible product functions. Since MVP methodology assumes leaving out all fancy product features leaving only those, which would actually let the prototype work, it’s not always easy to define which scope of possible features is really essential for design and product development. What Are the Signs That Can Indicate You Should Turn to Outsourcing Product Development? absence of MVP project management experience. Success of the prototype depends much on how thoroughly it was planned and project management experience is the key to detailed and correct planning. Many startup owners come from non-IT fields and have never managed building a technological product from scratch. In this case turning to a full-service agency is highly recommended to have successful MVP startup development. lack of resources. Sometimes startups simply have no reasons to keep the whole team of developers and designers in their office, since the business itself operates in a different industry. In this case hiring and educating in-house team sounds unreasonable, and outsourcing product development to IT company and for MVP startup coding would be the most affordable and effective solution. lack of technological expertise. One of the key advantages of cooperating with large outsourcing companies for MVP startup web development is their ability to advise the best technological solution and possible frameworks suitable for minimum viable product development. So if a startup has an idea of “what” they would want to do, but not “how” to do it, outsourcing product development will be the optimal solution, which solves design and product development issues at once. Does Turning to Outsourced Product Development Can Be Dangerous? request references to prove company credibility.  What Are the Stages of Working with an Outsourcing Company? Working with an outsourcing company is quite straightforward: a client submits the project requirements and receives an estimate split into milestones from the Project Manager. Additional details and questions from the development team about MVP startup engineering are discussed with the client during the phone call. Client and Account Manager agree to the delivery dates and payment schedule and client signs the contract meaning the start of the project which usually is native or hybrid mobile development. Within the agreed time frames a designer prepares the wireframes and UI/UX mockups, the client reviews and comments on them. Once the design is approved, developers start coding the product and deliver it within the agreed deadline. Before the product goes for review to the client, it passes QA testing and possible bugfix. After completing the adjustments requested by the client, the company delivers the final product. 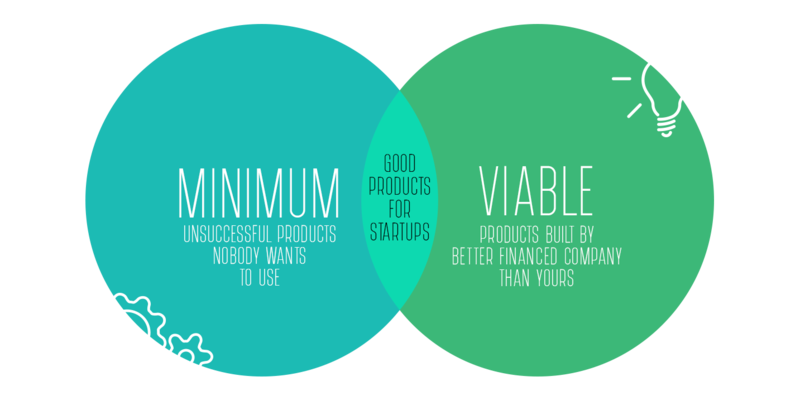 Minimum Viable Product or MVP is a type of software product in which the abstract idea of a startup business is put into the real-world product with very basic features. 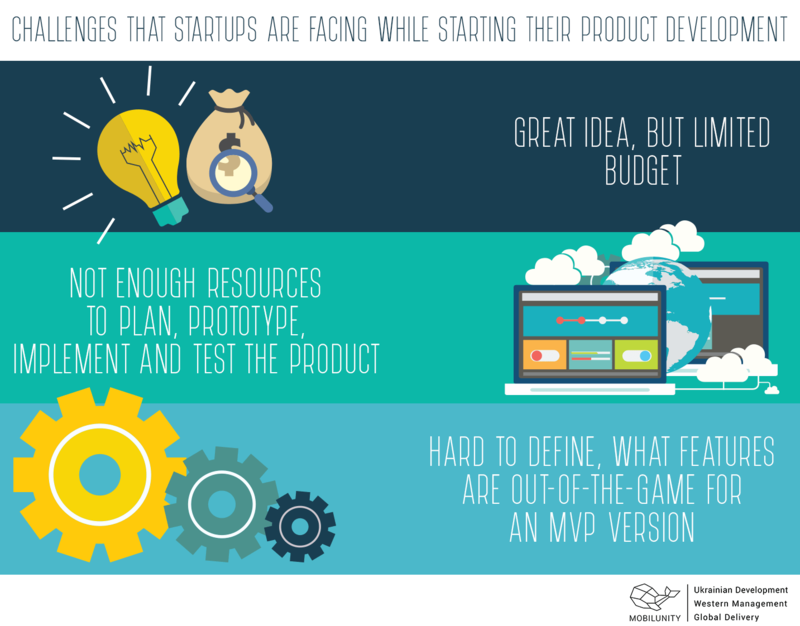 This idea of product development is commonly referred to as MVP startup development. According to the Forbes report, more than 90% of the startup businesses fail. The remaining 10% of the businesses that succeed develop the software solution that is perfect for the needs of the customers in the market. Converting the disruptive startup ideas, which are very abstract at the start, into a 100% perfect solution for the customers is a very cumbersome and lengthy process. That long process normally leads to a huge cost. To contain the cost within the small budget and to collect feedback regarding the customer requirements MVP development process is followed in the software development. The main idea behind the MVP startup development is to reduce the MVP startup development rate of the conceived product. For this purpose, the MVP startup programmers adopt multiple technologies, software tools, and methodologies for the MVP startup product development. From the mobile app development perspective, the hybrid mobile app development is adopted in the MVP startup development, which reduces the cost tremendously as compared to the native app development for multiple platforms. According to the Small Biz Trends, more than 77% of the startup finance comes from personal saving and the initial funds. So, the arrangement of funds creates so many challenges for startups. The average cost of an MVP startup development is about twice low as compared to the native product development. The major component of MVP development is the cost to hire MVP startup programmer. The average cost of MVP startup app development is between $20,000 and $30,000. The cost will reduce if the entrepreneur chooses the freelancing MVP startup coders. The average salaries of the software developers, which include the MVP startup engineer salary, is more than 20% higher than the other average salaries of the other graduate jobs in the United Kingdom. According to the Undercover Recruiter website information, this trend also prevails in all sectors of the IT development. The average salary in banking IT sector is about 19% higher than the other tech jobs in the startups. There is demand for the MVP startup developer for hire is also increasing consistently in the startups hiring of tech talents. Normally, startups offer not only good salaries but also substantial numbers of stocks in the company. The trend of offering shares in the company stocks attracts many developers to join startup companies. The success ratio in startup businesses is very low, but the growth rate of business growth of startups is over 20 times faster if proper development and scaling of the product are done. The salaries in the field of mobile application development, especially in the hybrid/cross-platform app development, are increasing very fast due to the higher level of demand for MVP startup programmer for hire. The demand for MVP startup developer for hire has increased in all sectors of businesses as well as in all countries of the world. The average salaries in different countries of the world vary based on numerous factors prevailing in that particular country. The average salaries of MVP startup developers are listed in the following table. This is very important to note that MVP application development is very common in startups. Normally, the startups offer company shares to their employees. Those shares may account for a huge amount in certain cases of successful startups. MVP development has become the fundamental foundation for the disruptive ideas of startup businesses in the modern field of software development. The entrepreneurs highly focus on the MVP development to materialize their abstract ideas of startup businesses based on the software products. The most crucial and disruptive startup ideas in the field of mobile application development are normally powered by an abstract visualization of the service, which will open up the demand of the apps based on innovative ideas of product features, which have not been introduced in the market yet. This complexity of ideas, product, and its features makes it very mandatory to develop a prototype service based on the new features, which will fulfill the innovative needs of a user. One of the latest Mobilunity experiences of multi platform application development was the GLEAT project founded by ambitious UK startup. GLEAT is a mobile app which connects people fond of dining in and delicious home-made dishes. When GLEAT CEO and co founder Mirko Lagattolla started cooperation with Mobilunity, there already existed a version of dining application which needed debugging and modification. The process of testing and fixing was neither long nor challenging due to the fact that this was a hybrid MVP, and developers and QAs had to work with one code only. On the whole, the issues with the existing app were corrected within 10 days and immediately the Discovery phase for a new upgraded version of the app began. This example again proves, that cross platform hybrid apps are the best choice for MVP software development of startups, as this is the right way to spare money and effort and deliver a product worth of investments. Can a Company with the Ready Product Request Improvements of It from the Outsourcing Company? There are no limitations of the types of companies, which could benefit from outsourcing product development to dedicated IT companies. Even if the company already has existing products and would like them improved or fixed, it may still turn to the outsourcing company. Such companies as Mobilunity provide full-cycle MVP development services for startup from basic prototyping to custom systems development in addition to website maintenance, marketing and client support services. So whatever request online company may have in mind, the task could be outsourced and effectively done. How to Hire MVP Startup Developers? As the demand for MVP startup developer for hire is huge in the present day marketplace. The increased demand for MVP developers has pushed the salaries sky high. Lofty demands of MVP developers in the local markets force the startups to search for the other options for hiring the MVP startup developers. All of the above-mentioned ways of finding an MVP startup developer involve long processes related to different stages of tech talent hiring procedure. Those processes involve different types of technical skills and hiring expertise, which are not possible in an entrepreneur. The hiring process is also governed by the local government laws, labor rules and many other complexities. The most commonly used ways for hiring the MVP startup engineers are mentioned below. This is the oldest way of hiring any tech human resource in the world. In this way, the job advertisement is issued to local newspapers or other print media. The candidates apply for the job. The job applications are shortlisted and processed for hiring procedure. This is a lengthy and costly process, which is also governed by many stringent rules and regulations. Outsourcing is one of the most important on-premises as well as remote hiring methodology. This is a fully managed type of hiring process in which the control over the team the responsibility of the company that gets the outsourcing contract. The client has very less control over the team but has to talk to the management of the outsourced company. This is a bit cheaper than traditional hiring. This is one of the most popular ways of modern hiring of MVP programmers. In this model of hiring, the client has full control over the team as well on the project. The job outsourced company is fully responsible for providing the complete development environment, tech team and guarantee to complete the project within a specific timeline and budget. This way of hiring is cheaper, reliable and fully managed. Freelancing is one of the cheapest ways of MVP engineer hiring. You can hire MVP developer at very low prices on any good freelancing websites, but the reliability of the freelancer is considered as the worst of all other ways of hiring. The freelancer can go away or back-out of your contract without any intimation. This is considered as the most unreliable way of hiring as compared to all other hiring models. Launch your MVP development easily with us by your side! Contact our team for detailed information.